Avenston is Ukrainian engineering company focusing on the implementation of renewable energy projects and technologies. Its main specialization is the design, construction and operation of industrial solar power plants. The portfolio of our team includes 8 years of experience in the Ukrainian solar energy market and more than 100 MW of projects successfully put into operation. The headquarters of Avenston is located in Kiev (Ukraine), and the structure of the company includes several business areas. Avenston is directed on turnkey project management and implementation of renewable energy projects. Our qualifications and professional experience allow us to carry out projects of any capacity and complexity. We practice an individual approach to each client, whose goal is the most effective solution of problems and long-term cooperation, and set the quality standards in the industry. 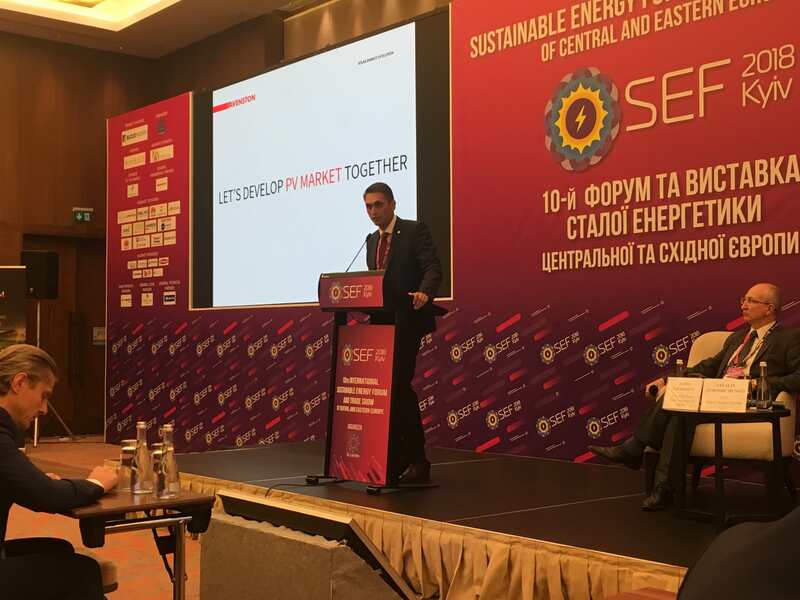 In October 2018, CEO of Avenston Mr. Dmytro Lukomskyi, spoked at the 2nd session of the Forum “Sustainable Energy in Eastern Europe” and the conference “SEF: Solar Energy” and shared with delegates his vision of solar industry development. In his speech, Dmytro spoked about global trends in global solar energy and their impact on the Ukrainian market, as well as prospects for future development of the industry. Within the speech of our company’s head there were keynotes about forecast for a gradual transition to distributed generation and increasing share of small and medium-power projects. Mr. Lukomskyi also expressed his opinion on the wider introduction of such promising technologies in the next 3-5 years such as hybrid generation systems based on photovoltaic systems together with storage systems (storage) of electricity, hybrid generation systems based on a combination of photovoltaic systems and systems using other types of RES, BIPV solutions and high-performance solar modules (Si, CdTe, etc.). In his speech, Dmytro briefly described about the history and activities of Avenston company, shared information about the projects that our team is currently working on and encouraged top players in the market to work together. “Let’s develop the solar energy market together” – suggested Mr. Dmytro at the end of his presentation. Thanks to the availability of state support and in spite of the difficult economical and geopolitical situation, projects on the basis of clean technologies are already actively implemented throughout the territory of Ukraine. And solar power today occupies a leading position among them. In recent years, there is strong interest to solar energy projects observed by both local Ukrainian investors and a large number of foreign players. Companies from Israel, Canada, Norway, China and some other countries have already invested and still are going to invest more in our country in the nearest future. Avenston strongly supports the most transparent, open and honest market relations. We actively implement solar energy projects and invite all who’s interesting in dialogue and mutually beneficial cooperation! You can find the materials of the report of the Avenston company representative at SEF-2018 at the link – «Solar PV Industry: Global Trends and Ukrainian Market».